This module clocks in at 24 pages of content , 1 page front cover, 1 page editorial, 1 page of which is the SRD, leaving us with 21 pages of content. This review was moved up in my reviewing-queue due to me receiving a printed copy of the adventure. All righty, this is an adventure for characters level 1 – 3, with well-rounded groups being the preferable target demographic, as often the case. This is a one-man operation, with the maps and artworks provided by the author as well. The cartography in b/w is solid, but does not provide a grid/scale or player-friendly, unlabeled version per se – however, it is cleverly constructed in a way which allows the GM to print it out and cut out the map section sans the labels, making the maps functionally player-friendly. Let it be known that this book looks very professional from the get-go: Read-aloud text (which is flavorful) is clearly set apart from the text and color-coded, and important key words are bolded – whenever they point towards a locale, an item, etc. that has its own description/section, we have the information in brackets. This may sound like a small thing, but from an information-design perspective, this renders running the module surprisingly easy for the GM. Indeed, in spite of being basically an investigative sandbox, this adventure can be run with minimum prep time, courtesy of its smart presentation. That’s definitely more forethought than I expected from a freshman offering. This is even more evident when it comes to room/locale descriptions – below the read-aloud texts we actually get helpful bullet-points that list items of interest/interaction points, rules-relevant information, etc. The pdf also provides quite a few helpful minor magic items – for example a helmet that provides advantage on saving throws versus being stunned. Here, I need to nitpick their formatting a bit – no item scarcity is noted and “Attunement.” is bolded, when it should be both italicized and noted in the line for item scarcity. That would be a cosmetic hiccup, though. EDIT: And this is where this module deserves a re-evaluation: Where previously, we got barely functional stats, the revised edition now features abbreviated statblocks in the front, where they are relevant, and full statblocks in the back, in case you need to look up some obscure rules-interaction. This is a VAST improvement for the pdf! Coupled with the fact that even e.g. a goblin gets some personality, his own agenda and responses to news and the like, we now thus have the proper mechanics to supplement narrative class: We get dialogue options, guidance and this super-neat presentation; heck, even mundane, interesting items such as letters get detailed descriptions – in the fluff department, this totally excels. But to properly explain what’s sets this module apart, I need to go into SPOILERS. Players REALLY should skip ahead to the conclusion. Seriously. Reading on will thoroughly SPOIL the adventure, and you don’t want that. Okay, are only GMs left? Are you sure? One more time: I will spoil this thing! Big time! So, “Saving Saxham” begins as generic as it can be – there is a small village called Saxham, established by the wealthy Sax family, courtesy of the grist mill. As the adventurers arrive in the town, they will be puzzled indeed – a curse seems to have taken a hold of Saxham – houses are dilapidated an overgrown, weeds are all over the fields, and, as a boy tells the PCs en route, monsters are in the woods. All of these observations, save one, are correct – in the woods, there indeed are monsters – and as the local elves have come to investigate, there is a similar problem – the forest seems to be suffering a mysterious blight. Strange variant zombies, so-called clayskins (things of clay) and woodwalkers (basically woodzombies with green berries for eyes) lumber through the forest, with the former evolving into the more deadly, second form over time. This is a fantastic and clever conundrum, a great twist, and frankly renders this one of the coolest first level modules I’ve read in a long while. I absolutely love it! Editing and formatting, on a formal, and now also on a rules-language level, are excellent; the combination of easy to use shortened statblocks and full stats in the back is amazing. The pdf comes laid out in a two-column full-color standard with b/w-artworks and cartography, and a low-res version as well. The pdf does not have bookmarks, which constitutes a comfort-detriment – I strongly encourage you to print this out when running it. Joseph Robert Lewis’ “Saving Saxham” was a HUGE surprise for me. First, I enjoyed the presentation and clever way in which the scenario handles information. Then, my spirits sank as I saw the statblock issue –an issue, which, as per the writing of this review, is no more!! 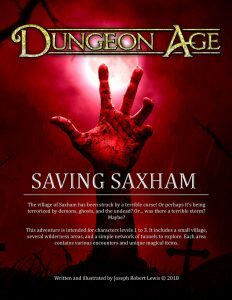 I read this…and my reaction was: “Oh boy!” “Saving Saxham” is a fantastic, slightly weird fantasy-ish/dark fantasy module that provides a truly tricky moral conundrum, a clever story and evocative prose. This feels like a module I’d run in my home-game; it is clever, smart, and yes, fun. It has a very distinct narrative voice and is more creative than a TON of modules I’ve read. This is a true winner, and as a person, I LOVE it. If you have similar tastes, then do yourself a favor and check this out!! Better yet, its revised edition now provides the rules-integrity to supplement the amazing angle, making this pretty much one of the best modules for PWYW that you can get. My final verdict for the revised iteration will be 5 stars + seal of approval – get this ASAP! You can get this amazing little module for PWYW here on OBS!